We’re currently taking applications for our 2019-2020 cohort. Weekends: September 27-29 (includes Friday evening), October 19-20, November 9-10, December 14-15, Jan 18-20 (includes Mon/MLK Jr.), Feb 15-17 (includes Mon/Pres), March 7-8, March 28-29, April 18-19, May 9-10. Thursdays: September 26, October 10, 24, November 7, 21, December 5, 19, January 9, 23, February 6, 20, March 5, 19, April 2, 16, 30, May 7. Why do a yoga teacher training? Yoga is a practice rooted in another time and culture and yet there are some distinctly modern elements in today's yoga class. Think about when Virabhadrasana 1 and Beyonce coexist in a classroom in College Park. Over our training, we want to ask the questions: Where is this expression of yoga coming from? What have we taken from its roots and how have we changed it? What is of service to me particularly from this tradition? What is it that I'm teaching/practicing/sharing and why? In a world of drop-in yoga classes amidst a busy lifestyle, sometimes the depth is hard to get to. That's why we've designed our 200 hour training to have an abundance of direct training hours, span nine months to give you time to gain depth in your understanding, skills, and relationships, and we are bringing in some expert guest teachers to offer what we think is the very best alignment and flow yoga training in the area. If you are looking for depth in your study and practice, feel like your yoga practice is awakening something new in you that you want to explore, or know that you want to be a yoga teacher already - we'd love to have you apply for a spot in our 2019-2020 teacher training cohort. Why do your training at Numi Yoga? - Sarah Park, E-RYT 200, Laura Teal E-RYT 200, RYT 500, and Kelsey Starr, RYT 500, will guide you through our coursework with joy and playfulness. We'll be guiding you through our teacher training - during our assigned dates and in the studio every week for classes (your unlimited yoga pass is included in your training!). - Sam Rice, E-RYT 500 will be joining us to start out our training. Her humor, kindness and keen knowledge of the postures will start us on our journey. Learn more about her here. - Christina Sell, E-RYT 500 will be teaching an unforgettable weekend for our training - you do NOT want to miss this opportunity to study in a small group with a nationally known teacher of teachers. Her humor, clarity, and inspiration have guided our studies and we are excited to share her with you. Check her out here. - We chose a weekends and weeknights based format over the course of a year because we believe depth happens as we soak in information and practice over time with the rich support of building community around the teachings (and becoming teachers!). When you graduate you'll have been thinking about and practicing teaching for almost a year - you'll feel the difference. We'll go beyond Yoga Alliance's requirements to offer you a full toolbox for your practice. Techniques, Training, and Practice (100 hrs): Learn the ins and outs of major pose categories and their alignment options, benefits and contraindications, how to modify poses for all levels, and how to use props to advance our work in the pose. We believe that depth in the "basics" or foundations are the keys to both good teaching and developing awareness. We'll learn the "rules" of yoga alignment and then talk about how to intelligently break the rules and creatively sequence for peak poses, understanding key actions, and working with different populations. Teaching Methodology (25 hrs): Discover the teacher already within you and develop your voice as a teacher for others. Build tools about how to clearly communicate in the classroom - teaching to different learning styles and bodies, clarifying verbal cues, skillfully using demonstrations, supportive hands-on-assists, teaching private lessons, and using props. We'll practice guiding one another through sequences, teaching groups of friends, and offering community classes to the Numi network. Anatomy and Physiology (20 hrs): Dive into the muscles, bones, and fascia within the pose and use these disciplines to understand what is happening at different layers within the body as we move. 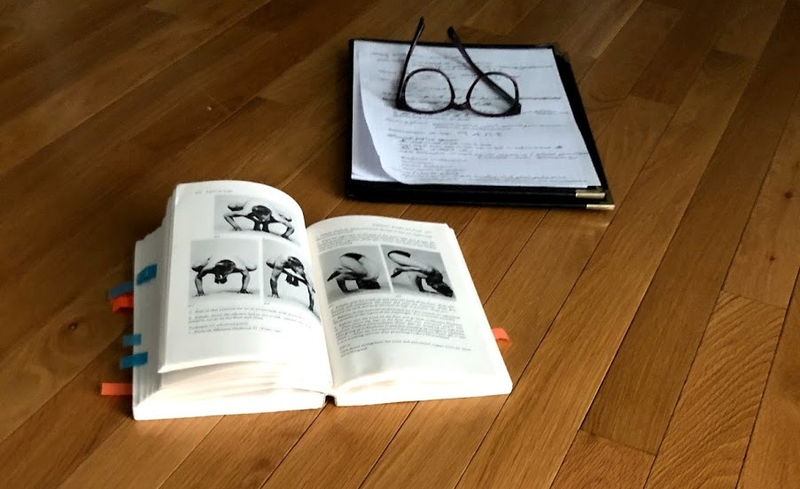 We'll come from an applied kinesiology approach to movement and biomechanics to inform what we are doing in asana and why we say what we say when we teach. Yoga Philosophy, Lifestyle, and Ethics for Teachers (30 hrs): Read some of the classic texts in yoga and apply the philosophical principles to your life in a way that you can authentically share. We'll discuss these ancient principles in modern contexts and apply lifestyle choices and ethical behaviors to the role of being a yoga teacher in a public classroom or private lesson setting. Explore the practices beyond asana like mantra, meditation, pranayama, and contemplative arts to support your journey inward. Practicum (10 hrs): Put your work into action by observing, assisting, and teaching in our public classes at Numi Yoga (and beyond!). We're glad you asked! We're meeting on weekends over 9 months (September to May) and meeting on two Thursday nights (6:45-9:15p) a month to supplement the intensives, explore questions, and continue to build asana and teaching skills together. Hours for intensive weekends are approximately Fridays 6-8p, Saturdays 1:30-7:30p and Sundays 12:30-6:30p (weekends with guests may have different hours). On our last weekend we'll have a special graduation ceremony in the evening where friends and are also family invited! Full tuition investment is $3600 and due with this application by September 1, 2019. Early bird pricing is $3200 if we receive your application and $600 non-refundable deposit by May 1, 2019. The remainder of all balances is due September 1, 2018 in full or by payment plan. We are proud to offer two half-tuition scholarships to applicants that add diversity (we need your voices!) to the yoga field. Please send us an email (hello@) for more information. Limited work exchange positions are available to help with the cost - please reach out soon if you are interested, the application and deposit deadline for work study positions is June 1. An interview with our manager and the availability to cover a 3-4 hour weekly shift during the Sept-May program is required. Applications and deposits for work study positions are due June 1, 2019. Email (manager@) for more information. Alternatively, payment plans are available as 7 monthly installments of $445 (totalling $3,115) after your $600 deposit and will require a credit card to be placed on file by September 1 (monthly charges begin by the first program date).